Looking for the perfect engagement gifts and presents. At Winemax we have the perfect unique and personalised Engagement gifts you can personalise for the couple. Add a photo of the couple on their engagement and add your personalised message to them wishing them a happy future. Our personalised wines are a very popular gift for engagement presents and the gifts look even better when you add a presentation gift box to the engagement gifts. Personalised engagements gift are great gifts to give to give because they are unique and special to the recipients. They make a wonderful unique engagement gift for the couple. A really great idea is to have two bottle personalised, one with the man on it and one with the woman, he will really love a bottle of red wine as a gift for him and a nice Sauvignon Blanc wine as a personalised engagement gift for her. Then unite the two bottles of wine in a really nice presentation wooden gifts box, making the personalised engagement gift even more special. When you bring this gift to the engagement party everyone will be awe struck with your gift by how special and unique it is, and also the engaged couple will really love it and treasure it too. What do you spend on Engagement gifts, and is it worthwhile spending more money on unique engagement gifts? That is a good question and if you are looking for you gift to stand out and be noticed by the engagement couple then it is definitely worthwhile spending a little bit more to make the engagement gift more unique. You should consider how close you are to the couple who are getting engaged, if they are only some people from work then a more generic gift will suffice, but if it is someone in you family such as you brother or sister then you will want to get them a really special gift or even special gifts! At Winemax we have the perfect gifts for the engagement couple and are gifts are great value for money because they are unique and special to the couple. You can personalise the gift with their photo and a unique message to the couple. Whoever you buy the gift for they will really treasure and be grateful for such a wonderful personalised and unique engagement gift idea. Sometime you will go to many Engagement parties in a couple of months and need a unique engagement present idea each time. 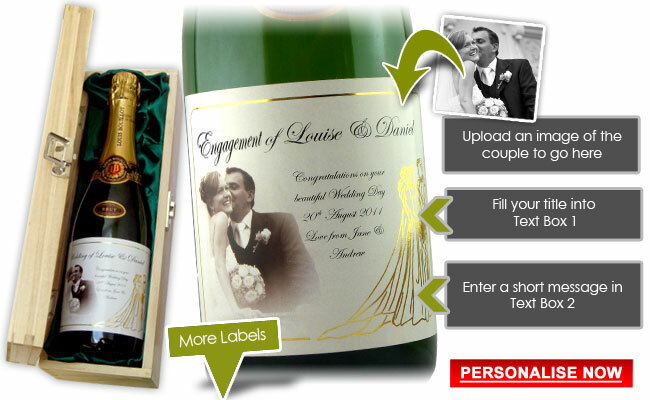 With Winemax you can get a unique engagement present each time, just choose your wine or champagne label and then personalise the present with a message to the engagement couple. The unique present idea will blow the Engagement couple away with both the quality of the gift and the design on the gift idea. Engagements gifts must be special and unique and most importantly memorable. It is important to get a Engagement gift that is special to the recipient. Our selection of Engagements gifts are special as they can be personalised to the couple that are getting engaged, with our personalised wine and Champagne gifts you can even upload an image of the couple to make the gift extra special. Put your engagement gift in a presentation to box to present the engagement gift to the couple at the engagement celebration party. Engagements gifts from Ireland. As we are based in Ireland you can be rest assured that our gifts will arrive on time and can be delivered direct to anywhere in Ireland. If you are living in Dublin and want an engagement gift delivered to Cork, Limerick or even Belfast we can do that. Winemax is a Irish based business that specializes in personalised wine and wine related gifts for Engagements and many other occasions. Personalised engagement gifts are the perfect idea to give to your friends or family that recently got engaged. You can choose from many personalised engagement gifts and presents ideas. Our most popular engagement gift would be a bottle or two of personalised wine or champagne, but if the couple aren't big drinkers you can choose from other personalised engagement gifts, such as personalised glasses or engraved personalised engagement gifts. Need an idea for an engagement gift, then you will find many new and interesting gift perfect to give as an engagement gift. You can choose from personalised wine or champagne to a personalised engraved set of crystal champagne flutes each one engraved with a message to the couple with the date they got engaged. Good engagement gifts for men can include personalised wine or a personalised bottle of whiskey or even a personalised crystal engraved whiskey tumbler. This make great engagement gifts for men and together as an engagement gift set make a really special gift for a fiancee to give to her fiance on their engagement. Men can be really hard to buy for so finding a unique and special engagement gift for men can be hard, but at Winemax our elegant yet special and unique gifts are perfect for men. Also, you can add a funny and entertaining message on the glass for a truly special engagement gift for men. A very unusual Engagement Gift is a bottle of personalised wine or sparkling wine such as champagne. A great and unusual engagement gift for couples we sell is personalised sparkling Engagement Champagne that you can add a picture of the couple who recently got engaged. This makes a great unusual gift for him or her and they will really love the gift if it is presented in a beautiful presentation box. Some people may really enjoy an engagement gift with a bit of humour and a funny engagement gift may be the perfect engagement gift for a couple. They will be getting a lot of serious engagement gifts so something a little bit different and unique with a bit of humour will really make your gift stand out. An example of a funny engagement gift would be a bottle of personalised sparkling wine Champagne with a funny picture of the couple on it and a little one liner written on the bottle also saying who the engagement gift is from. A humorous and funny engagement gift will make an everlasting impression! Did your best friend just pop the question and she said "yes"? Or, are you attending a close relative's engagement party? No matter what the instance is, what you would probably do is search for the best engagement gifts for couples. Well, if you are looking for something unique and memorable, you need to go for a personalised bottle of champagne from Winemax. Wish them a happy future by including a special message on the bottle, along with a photo of the engaged couple and also the date of their engagement. We can guarantee you that this would be one of the very few engagement gifts that will remain fresh in their memory for a long time to come. Planning to throw a surprise engagement party for your Irish friend? Have you thought about getting the couple a perfect Irish engagement gift? If you are not really sure of what to get them, go through our list of Irish engagement gifts to find that perfect one. From personalised crystal champagne flutes to whiskey tumblers and even their very own bottle of champagne, your choices here are many. No matter what gift you choose, you can have it personalised with a special message, engraving the couple's names, date of engagement, adding their photo, etc. to make your gift even more special. The gifts are hand prepared then delivered to any address throughout Ireland. Engagement is the first official step a couple takes towards spending the rest of their lives together. For an occasion that's so special, it is only fair that the newly engaged couple get some memorable and unique engagement presents rather than the usual ones. If you know one such couple who are about to celebrate their engagement, get them a bottle of champagne personalised to your liking. Yes, it doesn't get more unique than this! Add a cute picture of the couple, their engagement date, and a special message from you right on the bottle to make it unique, special and memorable. You've been invited to a nice engagement dinner by a friend and are looking for a cheap engagement gift that's also special. What are you planning to buy for the lovely couple? It is perfectly understandable that you may not always have the budget to get something luxurious. But, you don't have to settle for a completely unsatisfying gift as well. At Winemax, you will be able to find cheap engagement presents that are high in quality and value. Choose from a wide range of amazing gifts like a pair of crystal champagne flutes or whiskey tumblers, or even a personalised bottle of wine or champagne. Amazing yet affordable! So, your friends are officially tying the knot and you're invited to their engagement party. The first thing you would do is look for great engagement presents for friends. Who knows, you could be the best man or maid of honour! So, it is important that you make a lasting impression on the couple with the gift you choose. Choose a gift from Winemax and have it personalised with a friendly message or a simple "Congratulations!" to make it special for the couple. If you're choosing a pair of whiskey tumblers or champagne flutes, you can engrave the couple's names on them to make it unique - even add a personalised bottle of Champagne to the glasses to make a great engagement gift set for your friends. An engagement party is a very special occasion, attended only by close friends and family members. If you are invited to one such function as a friend or relative, you will have that extra pressure to make sure that you find good engagement presents for the almost-married couple. Find some good and affordable engagement presents for the couple on Winemax and customise it to make it special for their special day. Make it memorable with a good engagement gift!